It is truly amazing how quickly the technology in our industry is changing. We used to assume that a laser scanner would be obsolete in 3-5 years. Now there is so much hype on the benefits of laser scanning that companies are introducing new equipment all the time. In the past month alone, TruePoint has taken ownership of our first Leica P-40 scanner, our first drone, and we have entered the world of Dot Product’s handheld tablet scanner to supplement our long range scanners. It is amazing for me to look back and think that 5 years ago we purchased our first C-10 scanner and since have gone through several other generations of scanners including the HDS7000 and P-20’s which are now “old news”. There are many other technologies such as kinetic scanners (scanners that can move while scanning instead of having to remain stationary), mobile mapping and even promise of drones mounted with laser scanners. TruePoint strives to remain on the front edge of technology once it is proven to be accurate, practical and worthy of use on our clients’ projects. It seems daunting, but rest assured that TruePoint will continue to invest in technology that makes the end product better, cheaper and faster as things continue to develop and improve. Stay tuned to see what’s next… but don’t blink or you might miss it! Autodesk Navisworks is a powerful software that automates and assists the clash detection process (shown above). 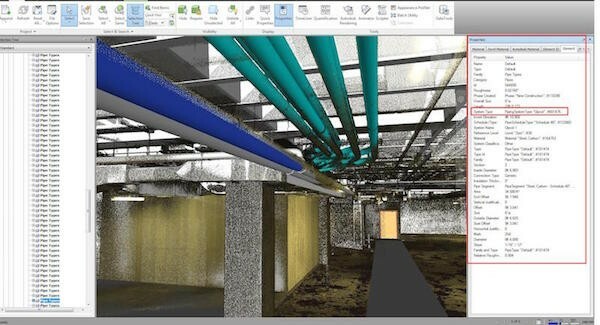 Aligning the point cloud and design model to each other offers assurance that clashes are discovered before significant fabrication or construction has to be re-worked. I would encourage you to check out this case study and more on our website at TruePointScanning.com.